I think I might make this topic a regular feature here. So here's a good one from her. She's getting ready to play Rockband just now and she says, "I'M ROCKSTAR......WITH NO PANTS ON!" Eye of the Tiger, originally uploaded by gotanyrice. Naomi: How do you make lemonade? Me: It's basically lemon juice, water and sugar. Naomi: We should make some. Me: Maybe sometime this summer. Naomi: And we could get some of those little umbrellas to put in our cups. Snuggies and Booklights and Toys...Oh My! If you have a child and you also have multiple siblings and parents, it's like you have your own Make-A-Wish Foundation. That being said Naomi's dream to own a Snuggie came true today courtesy of my evil...I mean generous brother. Snuggie Time from Dayna on Vimeo. Littlest Pet Shop Glee from Dayna on Vimeo. THIS is a definite must have. I think I'm going to get the 3-pack. No seriously I am. You never know when it might come in handy (i.e., camping, road-trips, stuck in traffic for 3-hours in the middle of the night going shopping on Black Friday). Actually, I mostly want to get one because I cannot tell you how many times Naomi has nearly had an accident in the car due to the fact that she waits until she is on the verge of wetting her pants to tell us she has to go. If you all play your cards right I might just get enough to give as gifts to every gal I know. Don't get to excited. I was fortunate enough to be given a large amount of Tupperware. I say fortunate because that stuff is EXPENSIVE, also, it was the kind that I already had some of and can use to further organize my pantry. The only slight problem with it was it had a very, very strong musty odor. I ran the stuff through the dishwasher three or four time but it still was pretty bad. It is wonderful to say the least and did the trick after only one wash in the dishwasher. It's probably extremely detrimental to the environment but what isn't these days right? This stuff smells FAB-U-LOUS! I'm thinking of spritzing Henry with it whenever we leave the house. It's very scrumptious. This is my sister's dog, Jack. Short for Jackson Nicholas Beauregarde. Pretentious much? He's almost a year old and is officially the fluffiest dog I have ever met and this picture is AFTER a haircut. He has wookie legs and the sweetest disposition. He's just your average big dope, very lovey. We were having an ongoing battle with Naomi for a while at bedtime. It would go a little something like this: she goes to bed, 10 minutes later she's thirsty, she's allowed to get a drink, she goes back to bed, 10 minutes later she's hungry, she's allowed to get a snack and go back to bed. I got kind of fed up with it (I was 50% sure it was just a delay tactic) so I just started telling her no whenever she'd get up, hoping that would solve the problem. Surprisingly enough, it didn't. She would absolutely meltdown and start wailing, "I'm so hungry! Are you just going to let a little girl like me starve?!?" Of course I would, I'm your mean old Mom. She got over asking for a drink but she continued asking for snacks after she was already in bed for the night. I finally wised up and just automatically gave her a snack about a half an hour before bed. Sometimes I astound myself at how slow I am to catch on to what is an easy fix to an annoying (ANNOYING!) problem. 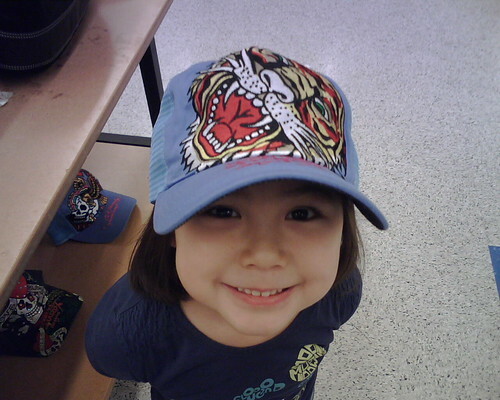 Now she just asks for her snack which is great because my memory...it's on a downhill slide I think. The problem was fixed until the other night when Naomi threw us a curve. She had drug out just about every toy she owned into the living room, and unfortunately for her she was having to clean it up. She just kept going SO slow and kept getting distracted and I kept having to nag/ask her to keep cleaning it up. I looked up at the clock and it was 10:30. I told her she could finish it tomorrow. Henry took her to bed, was reading her stories, etc., at which point I assume she asked him for a snack and he told her to come ask me (thanks honey!) because she moseyed out and asked me for one. I told her no I'm sorry it's very late, you took too long cleaning up and you know you're supposed to ask me before you're in bed. I might as well have told her that all the Disney princesses died. OH THE WEEPING AND GNASHING OF THE TEETH THAT ENSUED! It was truly one of her best performances yet. I was almost moved to stand and applaud. "Somebody call the wahhhhmbulance!" She goes back to bed, settles down and let's Henry finish reading to her. "Daddy, I have a really good plan. You go out there and pretend that you're hungry. THEN go get a snack out of the fridge. THEN you go to your office and get on the computer. THEN I'll come in there and you can give the snack to me. THEN I'll take it to my room and eat it and Mommy will never know." I was a little flabbergasted at how quickly she came up with this plan and how detailed it was. This truly was the first time she was really trying to be sneaky, which I hate the thought of. At the same time it made wonder, why on earth would she include Henry, her parent, in such a plan? It's like she knew she could turn him...or she hasn't clued into the fact that we're both the bad guys and we tell each other everything. Time will teach her that lesson soon enough. Do you smell that?, originally uploaded by gotanyrice. 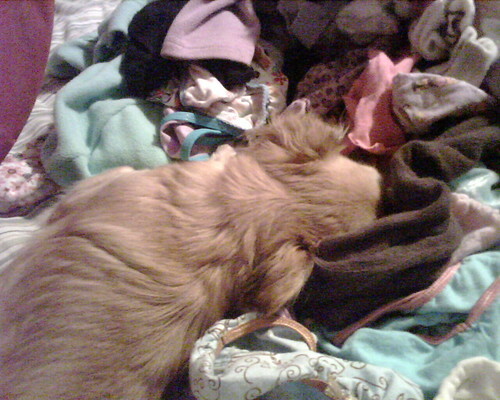 Umm...well....your napping with your nose buried in a pile of dirty undies, so that could be it. Dogs can really be gross. Like a fish...sorta, originally uploaded by gotanyrice. 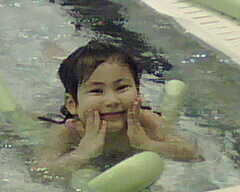 Naomi has swimming A.D.D. Anytime they use the noodles or other 'prop', she becomes completly distracted by it. She can't do anything but focus on it, where it's at, whose using it and when her turn to use it will be. I had the most uncomfortable conversation with Naomi today about, of all things cemeteries. We happened to be driving by one and she asked, "What are all those signs?" Naomi: What do most people die from? Me: Well people can get old and die, get sick and die or have an accident and die. Naomi: Or they can be shot and die? Me: [totally and utterly uncomfortable and flabbergasted and this point] Yes that can happen too. At that point I just started to tune her out and do "nod and smile" thing. I'm still trying to collect myself. Actually it's just a park ranger that works up at the Mt. Rainier National Park.